Served as director of Silent Unity from 1916 to 1971. She took the position only a year after finishing high school and was brought in to help the Fillmores, who, by then in their sixties, wanted someone to oversee the rapidly growing healing ministry. In his book The Unity Movement: Its Evolution and Spiritual Teachings, Neal Vahle said Rowland at first would go to Charles Fillmore for help with difficult letters. After a few times of providing her with the help she requested, Fillmore finally said to Rowland, “The Christ mind is in you, use it.” She went on to to be the longest-serving director of Silent Unity to date. This introduction to May Rowland is from Ponderings, A Visit With Dr. Catherine Ponder. Used with permission of Dr. Catherine Ponder. Thank you! 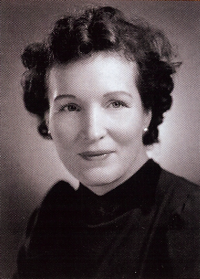 May Rowland has often been considered one of the most attractive and spiritually powerful women to ever grace the New Thought Movement. Her father was a Kansas City businessman who had embraced the teachings of Practical Christianity as taught by Charles and Myrtle Fillmore when the Unity Movement was in its infancy. As a result of that association, he became an avid student of Truth and a very successful businessman. He loaned the Fillmores the money to buy their first property for the Unity Movement. He also taught a Unity School class for forty years. The first time I saw May Rowland, she was leading her famous "A Drill in the Silence" meditation at a Unity School Retreat. That prayer process became so popular that it was later published in pamphlet form as "A Drill in the Silence," and still later she made a recording of it, which was enjoyed by people everywhere during their periods of relaxation, prayer, and meditation. Perhaps May's development and use of that prayer drill was in part responsible for her ageless look of youth and beauty. One of her favorite affirmations was: "I am young, strong and healthy. My body knows it and my body shows it." Richard Billings recalls his mentor, May Rowland. Go here for the full interview. Much earlier, she became an assistant to Myrtle Fillmore in what became the famous Silent Unity prayer department. She often told her co-workers, "Dress up when you come to work every day, because you are working for an important employer— God." One long time worker in Silent Unity, who was a great admirer of May Rowland, said she always placed her desk and chair where she could see May while they both worked. She felt May radiated an aura of light and enlightenment which she found uplifting throughout her work day. At the time I first heard May give her famous "Drill in the Silence" meditation at that Retreat, she had long since become the director of Silent Unity, and Vice-President of Unity School. She was dressed up in a proper "little black dress with pearls," an appropriate attire for the multi-faceted global retreat audience before whom she was appearing. 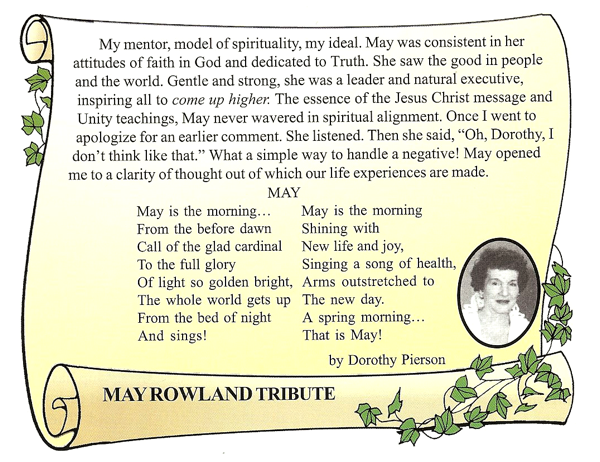 Some years after my first seeing May Rowland at the Unity Retreat, I had become a writer and a minister. Her signature appears on my Ordination Certificate along with other well known 20th Century Unity officials. By this time Wilma Powell was head of Silent Unity Prayer Room, and a good friend of May Rowland. In those days, Unity School employees worked only until noon on Wednesdays. They often then engaged in social activities through hosting or attending hosted luncheons with their co-workers from the School. Several times during those summer vacations I joined Wilma Powell in visiting May Rowland in her home on Unity Ridge near the School. At times we went out with others for either luncheon gatherings or accepted dinner invitations, after which we would return to May's home for private prayer group sessions. Prayer was a way of life with May, off the job, as well as on. Often her beloved sister, Eve, who lived next door, would be a member of our dinner party and prayer group. In the 1920s May had been married to Frank Whitney. Known as "Whittey" to his friends, he had developed the popular Daily Word magazine, which continues until this day to inspire its readers on a global basis. That apparently being Frank Whitney's spiritual mission for his life, he was gone soon after founding Daily Word. In later years, May often spent summer vacations on a Western ranch where she enjoyed the outdoors way of life it offered. She finally married a staff member from that ranch whom she had met some ten years earlier. She later commented, "I only wish I had married him when he first asked me ten years ago." When I visited her home, he proudly showed me the various improvements and updates he had made for her in her house and yard. After her retirement, May spoke to a standing-room-only audience at Unity Church of San Antonio, which I was still pioneering. She and her husband, along with her sister and her husband, were all on their way to Florida to spend the winter. At the meeting, I sat on the side of the room, close to the platform where I could view May speaking from a side view. As I watched her speak, I noticed an unusual phenomenon: as she spoke words, they were released into the ethers of the audience in forms of energy that gradually disintegrated. I literally saw the power of the spoken word in action as energy released. It was enlightening and uplifting to see the power of the spoken word loosed in such an obvious way. Later we lunched at the Canyon Creek Country club on the edge of the famous Texas hill country just north of San Antonio. Afterwards, my son and Eve's husband remained on to play golf among the gnarled oaks that were predominant amid the spectacular beauty of that golf course. May is gone now, but "the memory lingers on." How fortunate I was to have known one of the greatest, yet most unassuming, spiritual giants of the 20th Century. The word "unforgettable" not only belonged to the musical legend, Nat King Cole. It also belongs to one of the spiritual legends of the New Thought Movement: May Rowland. © Catherine Ponder. All rights reserved. No usage or posting of any kind is permitted without prior written permission from Catherine Ponder. Used with permission. My mentor, model of spirituality, my ideal. May was consistent in her attitudes of faith in God and dedicated to Truth. She saw the good in people and the world. Gentle and strong, she was a leader and natural executive, inspiring all to come up higher. The essence of the Jesus Christ message andUnity teachings, May never wavered in spiritual alignment. Once I went to apologize for an earlier comment. She listened. Then she said, "Oh, Dorothy, I don't think like that." What a simple way to handle a negative! May opened me to a clarity of thought out of which our life experiences are made. Thank you so much for this posting of May Rowland's "Come ye apart awhile." i used to have the tape but gave it away. Do you by chance have May's "A Drill in The Silence?" If so I'd loveit if you posted it. Blessings of love and gratitude to May Rowland. This audio file is sure to be a blessing to so many. Thank you for posting it and sharing it with all of us.